Jersey Boys might be closing in January after more than a decade on Broadway, but the bio-musical is alive and still working hard for your money thanks to the show’s director and choreographer. According to the New York Post, a musical about the life of Donna Summer is in the works with Jersey Boys’ Des McAnuff at the helm and Sergio Trujillo as choreographer. Featuring all of Summer’s hit songs, the musical is said to follow Summer at three key junctures: childhood, fame, and glory gone. A reading for the musical reportedly featured multiple women playing male roles, while Ariana DeBose — known from Lin-Manuel Miranda’s Twitter as “The Bullet” in Hamilton — played Summer at her height. 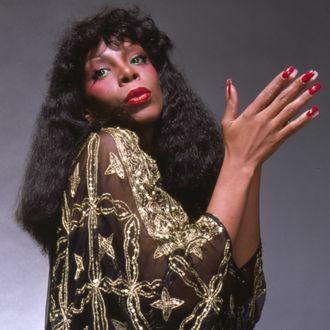 Summer became a disco queen in the ‘70s before floundering and finding controversy for allegedly calling AIDS a punishment by God for homosexuality, a comment the born-again Christian later denied making. Summer died in 2012, at the age of 63, of lung cancer, so “Last Dance” is about to sound a lot sadder.